Over the last several years, increasing the energy density of batteries has been a top priority in battery technology development, congruent with increasing demands for faster mobile devices and longer-lasting electronic vehicles. 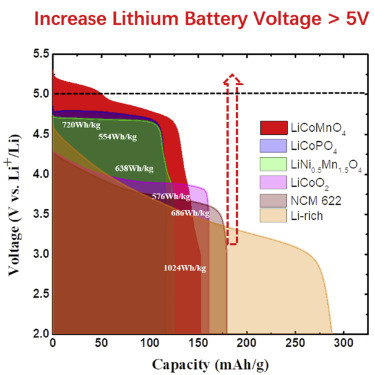 The energy density of lithium-ion batteries can be enhanced by either increasing the capacity of electrodes, or by enhancing the cell voltage (V). Extensive research has been devoted to exploring the pairing of various materials in the search for the most efficient cathode/anode mix, but until now, only limited advances have been achieved due to the narrow electrochemical stability window of traditional electrolyte. A specially designed electrolyte was also created, which is stable to 5.5V for both the LiCoMnO4 cathode and (graphite and Li-metal) anodes. This resulted in a 5.3V Li-metal cell, delivering a high energy density of 720Wh/kg for 1k cycles. What’s more, this battery chemistry boasts a Coulombic efficiency of >99%, offering new development opportunity for high-voltage and energy Li-ion batteries. Long Chen – a ChBE post-doctoral research associate – and Xiulin Fan – a ChBE assistant research scientist – served as first authors on the corresponding research paper, published in Chem on February 28, 2019.